Heat oven to 350°F. Line 2 cookie sheets with cooking parchment paper or silicone baking mat. In large bowl, beat all ingredients with electric mixer on medium speed until well combined (batter will be very thick). Using 1-inch cookie scoop, drop dough about 2 inches apart onto cookie sheets. Bake 10 to 12 minutes or until set. Remove from cookie sheets to cooling racks. If you don’t have cooking parchment paper or a silicone baking mat, spray cookie sheets with cooking spray. Don’t have a cookie scoop? A regular tablespoon will work fine. 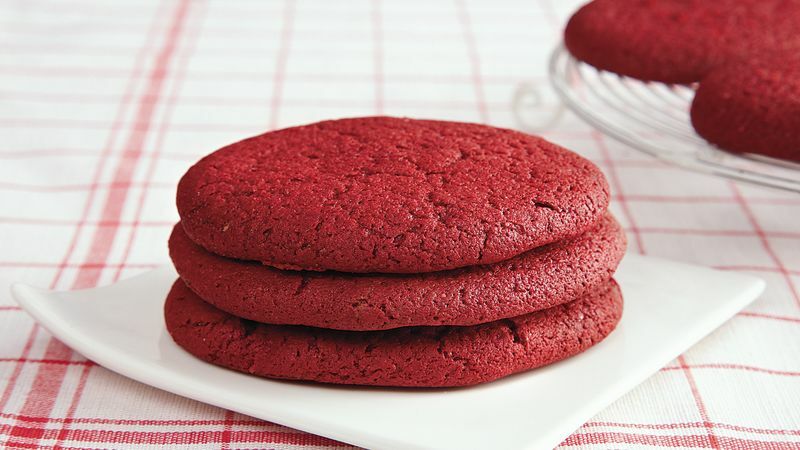 You can count the number of ingredients you need to make these red velvet cake mix cookies on one hand. And, they only take 25 minutes to prep, which means you can make a festive and chocolatey red velvet cookie, even when you’re short for time. The ease of making cookies from cake mix can’t be beat! There’s no measuring needed, and clean up is a breeze — no flour to wipe off the counters or sweep off the floors. Cake-mix cookies are dump and go, but that’s not the only reason they’re great. Cookies made from a cake mix turn out soft as a cloud and chewy as can be, and that great taste is the reason we keep making these cookies again and again. If you love all things red velvet, check out our red velvet cake recipes next.